Terry Hirst is the pioneer editorial cartoonist and comic author in Kenya. He made his mark with his witty illustrations for the leading daily newspaper and touched the young minds when he created the Pichadithi series. 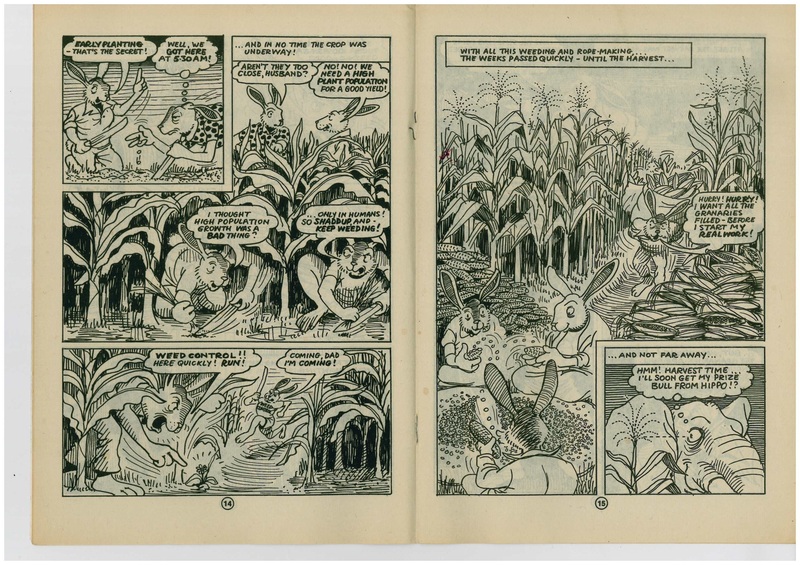 The series title was coined from two Swahili words Picha (pictures), (H)adithi (story) and was without doubt one of the longest published comic series that was also grounded in the African traditional oral literature. 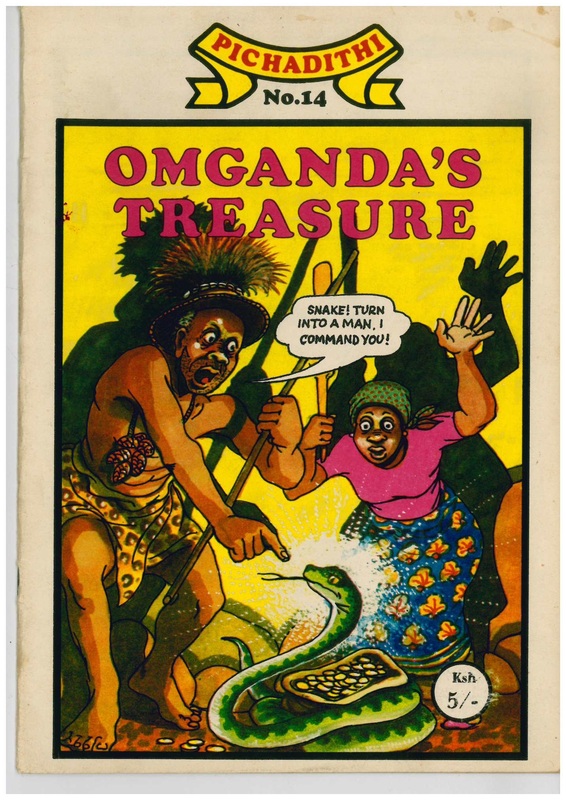 The series had over twenty-30-paged comics that were developed from various popular fables, myths and legends that were told in various Kenyan communities and they were a joy for the young readers. He talked to Msanii Kimani wa Wanjiru. Msanii Kimani: What inspired you to pen the Pichadithi series? Terry Hirst: It was in 1982, and Kenya had just gone through the trauma of the attempted coup d’état. Working in the mainstream media had become politically very repressive, and I had been forced out of my job as an editorial cartoonist on a national daily shortly before, and my re-appointment as a lecturer in graphics at the university failed to be confirmed in related circumstances. So, I was faced with the usual artist’s problem of how to make a living, which involves taking the products of an artist’s ‘gift economy’ and entering the market economy with them, and for this you really need a patron – or at least an agent. Msanii Kimani: It must have been difficult. Terry Hirst: The thing I wanted to do as an artist was to make comic books, but no comic book industry existed in Kenya, and I managed to persuade Kul Graphics, who were very much into the existing markets as pre-press professionals, as well as publishers, that an unexplored market existed that we could both benefit from. In effect, Kul Graphics had become my patron/agent, and would pay me up-front on receiving the completed finished, camera-ready, artwork monthly, thus financing the completion of the next month’s issue. Happily for me, the series was popular from the start, and soon achieved a monthly circulation of over 20,000 copies. Terry Hirst: For me, with all my troubles, it certainly was – but it was all set in a much larger context. Put it this way, all of Kenya at that time had gone through a violent trauma, as well as the shortages of food, the ‘sunset rice’, the ‘karafu’ and coffee scandals, and the ‘crack-down’ after the coup attempt had been very hard and unrelenting. My wife, Nereas N’gendo, and I both felt that the country – particularly the children – needed ‘healing’, so we thought that traditional stories from all over the country that everyone could relate to culturally, would not only soothe and entertain, but underline the unity of our diversity. Along with that, it also provided the opportunity to provide a well-researched material culture context for the stories that would not have to be explained – but simply ‘seen’ as the way people used to live their lives fully and sustainably. 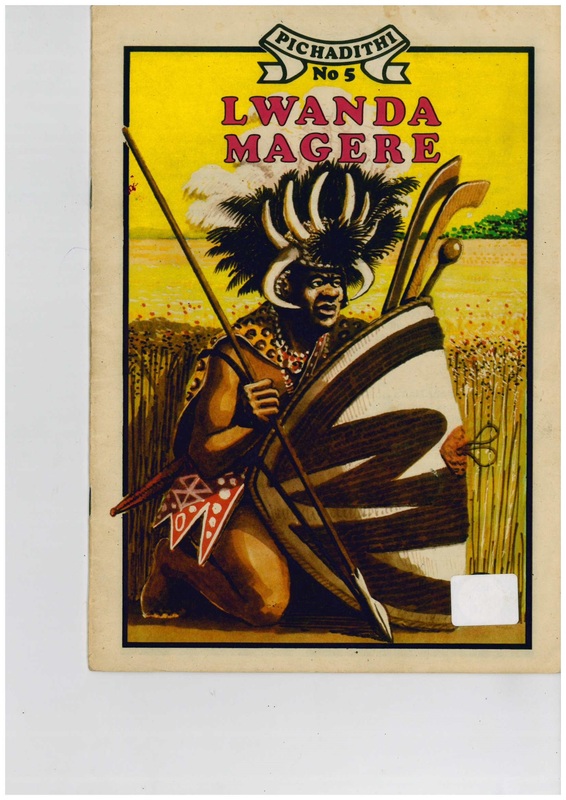 The first title was ‘Kenyatta’s Prophecy’, based upon a traditional story that the founding president had used to explain the struggle for Independence, and the sacrifices that had to be made in order to be where we were. Msanii Kimani: In the series you were quote saying that “An important part of our African culture is in the traditional stories which have been handed down by word of mouth over the years.” Do you think this has been threatened by the new media? Terry Hirst: The ‘oral culture’ is alive and well, and, in fact, the new media in the form of the reading of books, re-invigorated it so that it was largely collected by scholars and shared with the new young and the general public. But, with the vast majority of Kenyans still without electricity, we must remember what Okot p’ Bitek told us, that while we talk about the new media and culture, ‘all over the countryside the fires are being lit, and the stories are being told’. The new electronic media, and especially broadband, with its insatiable need for local ‘content’ can only re-inforce this trend – if our creative people are up to it, and recognize that we will always have the attraction of being ‘exotic’ in the international market if we resist the pull of the ‘flat-earthers’, and first build indigenous media markets, alongside the ‘mitumba’ entertainment products we all enjoy. There are ‘niche’ markets all over the world for authentic Kenyan, or East African, creative products, as the musicians are starting to prove. Msanii Kimani: Why was the series discontinued? Terry Hirst: I don’t know, to be honest. I had originally been contracted by Kul to do the first ten titles – the first year – which I thought would get me back on my feet, which it did. Then I left the series, and it continued long after that before it went down. My idea with the series originally was to create the beginnings of a sustainable comic book market, in which the graphic artists had full creative control over their work – the choice of theme, the storylines, the finished artwork quality and so on – while receiving adequate recompense in order to live on, and retaining the copyright to their own work. My contract had agreed all this, and I had assumed that the same terms would be offered to everyone else who would then work freelance on the series, that had proved to be very successful. At first it continued well, with talented young artists like the late Frank Odoi and Paul Kalemba doing titles, but then the ‘marketers’ took over, looking for cheaper artists, dictating editorially, and relaxing the graphic art quality standards – so that the artists lost control, and the series went down-hill. Msanii Kimani: I remember titles like Kenyatta Prophecy, The Greedy Hyena, Wanjiru the Sacrifice, The Amazing Abu Nuwasi, Lwanda Magere, The Ogre’s Daughter, The Adventures of Hare, The Wisdom of Koomenjoe, A Poor Man’s Bowl, Terror in Ngachi Village, The Cunning Squirrel, Omganda’s Treasure, Children of Sango, Simbi the Hunchback etc. How did you source these stories? Terry Hirst: You see, the ones that you remember include my original ten titles and the early ones of (Frank) Odoi and (Paul) Kalemba, before the artists lost control, and the marketers, reducing internal costs by cutting back on artist’s fees, turned the art products into ‘commodities’ rather than the artist’s ‘gifts’, that they were originally conceived as. But the actual sourcing of stories is not difficult; there are more than two thousand recorded traditional stories in Africa that are easily available! The difficult part is choosing a story that you believe your audience needed to hear, at that time, and shaping it for them so that it will resonate and have larger meaning, as well as entertain. Msanii Kimani: That is insightful. Terry Hirst: That’s what the stories were originally about – helping to shape a better you – not just for children, but also for adults. Many graphic artists, through the ages in a widespread tradition, but especially after the industrial revolution and the introduction of market capitalism, have developed, along with the storytellers and the ‘singers of the songs’, a form of ‘social commissioning’ from the communities they live and work among, in tune with their local audiences, and responding to their immediate cares and worries. If local creative people do not do it, the international market will soon move in and take over, largely on the basis of ‘something to tell for something to sell’, and supply that human need to ‘hear the stories’. Msanii Kimani: Does that mean a comic book market especially in Africa is confined to traditional stories? Terry Hirst: Not quite. A comic book market is by no means confined to traditional stories, of course. It is a vast and expanding field, as even a brief overview of global development of the comic book quickly reveals. I have written extensively about it elsewhere, and hope to set up a kind of ‘Sukumawikipedia’ about it in the near future, called ‘A Brave New Idea – Art for Ordinary Folks! An Overview of Caricaturists, Cartoonists, and Comic Artists, and the Modern Graphic Arts Tradition in the Globalization Process.’ This would enable young artists in our region to quickly see and understand – get the picture – of the universal culture of the medium, and the original social contribution they can individually and independently make by enhancing their own creative skills, and while – if they are any good – sustaining themselves independently and wholesomely. Msanii Kimani: That would be a gem to nurture the growth of the comic book in the region. Terry Hirst: The comic book format, this unusual union of literature and art, words and pictures, has contributed a great deal to the social cohesion of those societies in which it has taken root. From the late 1880s it has happened in those societies experiencing the trauma of massive urban/rural migration, that crossover of life styles that has occurred all over the world in the last one hundred years. In fact, no successful industrialized market economy has emerged anywhere in the world, without spawning a comic book industry to assist in the necessary balancing of forces, and the necessary introduction and education of the young into that social process, so that they understand what is expected of them. It has happened in Europe and North America, of course, but also indigenously in China, Japan, and eventually in India, Central and South America, and the Mahgreb, but clearly not yet in Africa South of the Sahara, where in my view it is so obviously needed. Msanii Kimani: Take me through the journey of your life— When & Where were you born? Are you the eldest or last born? How many are you in the family? Terry Hirst: Well it has been a long journey, since I was born in Brighton, in England, in 1932, as the eldest in a fairly dysfunctional family that I wouldn’t want to dwell on. Msanii Kimani: Was it a breeding ground for new talent? Terry Hirst: Brighton was a lively ‘holiday’ town, and a good place to grow up in, that nestles between the sea and the Downs, with a great deal of natural and public entertainment, good public galleries and libraries, and strong traditions in the theatre and the music hall, so that there was a vibrant social environment outside the primary social environment of the family. These are stimulating seeds for talent, if they fall on fertile ground, although World War II did much to close it all down. Msanii Kimani: Where did you go to school? What are some of the memorable thoughts of your life while you were growing up? Terry Hirst: We moved house quite a lot, so I went to many primary schools, until I got a scholarship to Varndean Grammar School, just as World War II was ending, and everything came to life again. I enjoyed a good liberal education, being introduced to literature, art, music, and the humanities, and having some skill in games got to travel fairly widely – if still locally. Msanii Kimani: What did you want to do in life? Did you always want to be a cartoonist? Terry Hirst: From quite early on I was sure that I wanted to be an artist. I had a facility for drawing that was well nurtured at grammar school, and it simply never occurred to me to think of being anything else. I used to entertain my friends with drawings, and found that I got great pleasure from it. Msanii Kimani: What prompted you to choose your career as a cartoonist? Terry Hirst: An important influence must have been my morning and evening job as a newspaper delivery boy. Everyday, for all the years I was in grammar school, I had a quick glance at all the national daily newspapers in England, and plunged into the graphic arts tradition of the editorial political cartoon, the comic strips and the ‘spot’ cartoons. I didn’t really understand what was happening, but from the 1940s to 1950, I came under the influence of powerful political cartoonists like Low, Zec, Shepard, Illingworth, Lancaster, Cummings, Giles and Vicky – from across the political spectrum– all shaping my thoughts and attitudes. 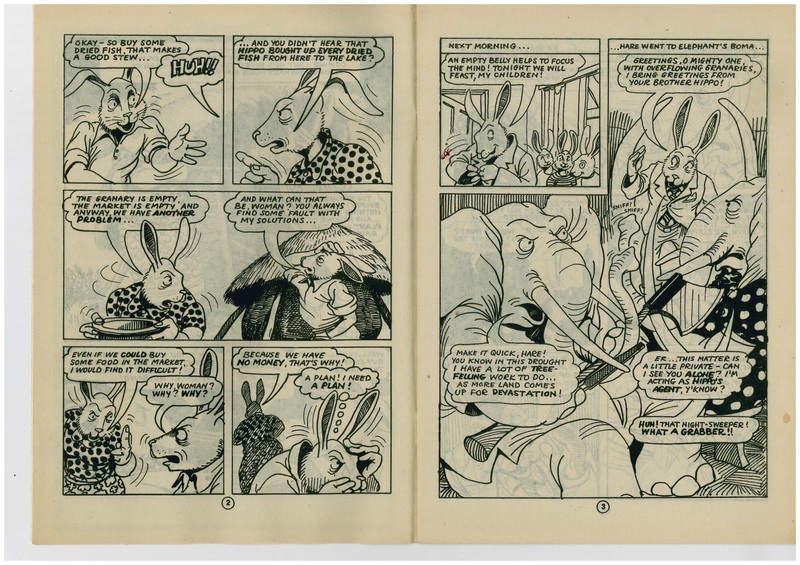 But it still had not occurred to me to be a cartoonist – I wanted to be an artist. Msanii Kimani: Where did you go to college? How was it? What are some the challenges and trials that you encountered while trying to learn the trade? Terry Hirst: I chose to go to Brighton College of Art, much to the annoyance of my headmaster, who liked to visit his former pupils in Oxbridge, and have never regretted it. Brighton attracted a host of well-known artists as visiting lecturers – people like Mervyn Peake, an outstanding draughtsman, and Woodford, a famous sculptor– since it was near to London. The specialist courses were broad and wide, and we could ‘taste’ everything, and in the cafes, night-clubs, jazz-clubs, music-halls, cinema clubs and theatres of the city, with fellow art-students, we could argue all night to make sense of it all. Msanii Kimani: That must have been fun. A vibrant environment no doubt! Terry Hirst: They were exciting years, training to be an artist. But there was, and still is, a catch! There is what John Berger calls ‘a tragic farce in English art schools’ – in fact it is in most art schools of the world – and this concerns the prospect of ‘making a living’, in an age when patrons no longer exist. The easiest option is to become a teacher, and the best artists get jobs in art schools, and ‘teach artists to teach artists, to teach artists!’ and hope to continue with their creative work – like my own visiting lecturers. The less well connected or able become secondary school art teachers, and slowly come to terms with the fact that they are too emotionally exhausted to do their own work at the end of a day. But it is possible, while difficult, and the media provide the option for graphic artists. Being an artist in the public media is largely self-elective – anybody can see if you are any good – you just have to prove it with the ideas and drawings. Msanii Kimani: That sounds like there were limited choices. Were there any dangers to an artist who made any of these choices? Terry Hirst: There are dangers in this for the graphic artist, because once you enter the market system all the pressures are upon you to become an entirely ‘commercial artist’ – as it used to be called – selling your skills to produce ‘commodities’ that other people decide are sellable. I had a friend at college, whose father used to draw two ‘double spreads’ per week for national comics called ‘Film Fun’ and ‘Radio Fun’, year in and year out. (He swore that the office boy wrote the scripts!) They lived decently, and the dad only worked in the mornings and went horse-racing almost every afternoon, but it wasn’t a life that attracted me. Msanii Kimani: Please give me an outline of the body of your works- the things that you have done- both in Africa and internationally. Terry Hirst: After graduating as an artist and a teacher, and completing my National Service in the army – where I taught–, I got a job teaching in Crawley New Town, that offered housing, clinics, and schools for my children, and was near to London. I started to build my portfolio of work, and approached a lively local newspaper to secure a regular weekly front-page ‘spot’ cartoon, commenting on local governance and so on. It proved to be popular, and I was invited to do a similar ‘spot’ for a nearby East Grinstead paper. Working just on the weekends, I started to get stand-alone cartoons and features into national magazines. Msanii Kimani: That was without doubt a good start. Terry Hirst: It certainly was exciting. On the teaching front, I was appointed Head of Art at one of the largest comprehensive schools in England, in Nottingham, but I continued with my freelance work in the national media, becoming a regular weekly cartoonist in the ‘Tribune’, and doing features for the ‘Times Educational Supplement’, along with cartoons for ‘Twentieth Century’, ‘Peace News’ and similar publications. But it was a heavy load; school teaching, teaching evening classes at the Nottingham School of Art and the WEA, along with my private practice – all to keep my head above water and pay my mortgage and install central heating, while trying to get up the courage to ‘go solo’ with my artwork in a very competitive market. Msanii Kimani: You worked around the clock. How did this change? Terry Hirst: It was hard work and then I got the chance to experience what Jomo Kenyatta had described as ‘the freedom that Europe has long forgotten.’ I was invited by the newly independent government in Kenya to head art teacher-training at the Kenyatta College. Kenya had no cadre of professionally trained art teachers for its expanding secondary schools, and the prospect was irresistible, along with the opportunity to set up an entirely new system of purposeful art teacher training, unlike the ‘farce’ of art school. Over the years it proved to be very creatively satisfying, with the first generation of students to graduate producing outstanding work that was featured in the internationally distributed ‘African Arts’ magazine. Msanii Kimani: Those were lively and very creative years in the country. 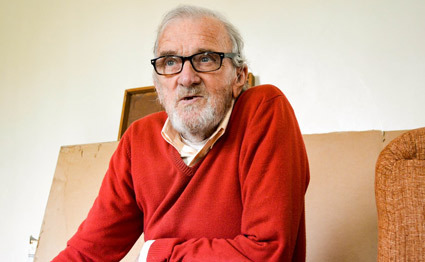 Terry Hirst: Creatively, Kenya was a very exciting place to be in 1965, and I soon made contact with the Chemchemi Arts Centre, that had opened up the art scene for the non-formally trained, and then the break-away Paa Ya Paa Art Gallery, where I met some of the most creative minds of the ‘independence’ generation. Elimo and Rebeka Njau, supported mainly by James Kangwana, the late Jonathan Kariara, Charles and Primila Lewis, and Hilary Ng’weno, had established the gallery and I was welcomed to join them, and stimulated to work. I eventually contributed two one-man exhibitions of paintings, which both sold out. Msanii Kimani: What did you make your foray into the local print media? 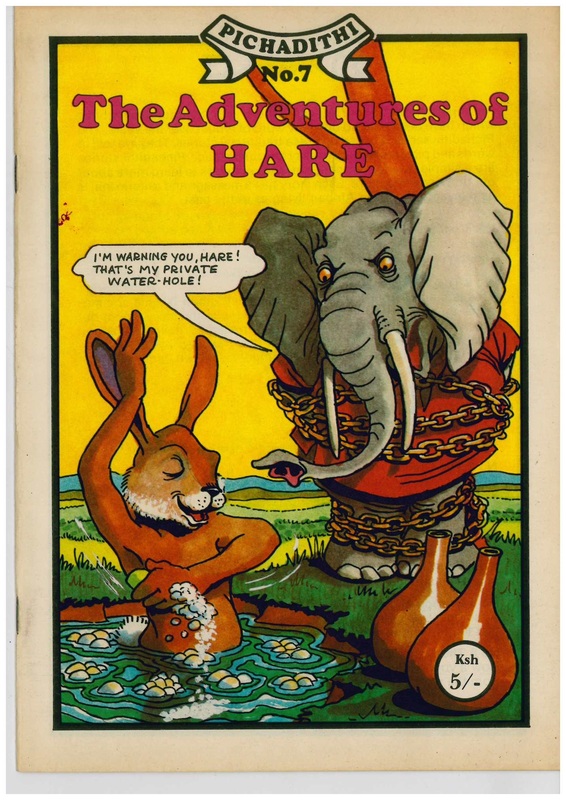 Terry Hirst: I had already started to draw as a freelance cartoonist for the ‘Daily Nation’, when Ng’weno invited me to illustrate his regular ‘With a Light Touch’ column, which proved to be very popular. 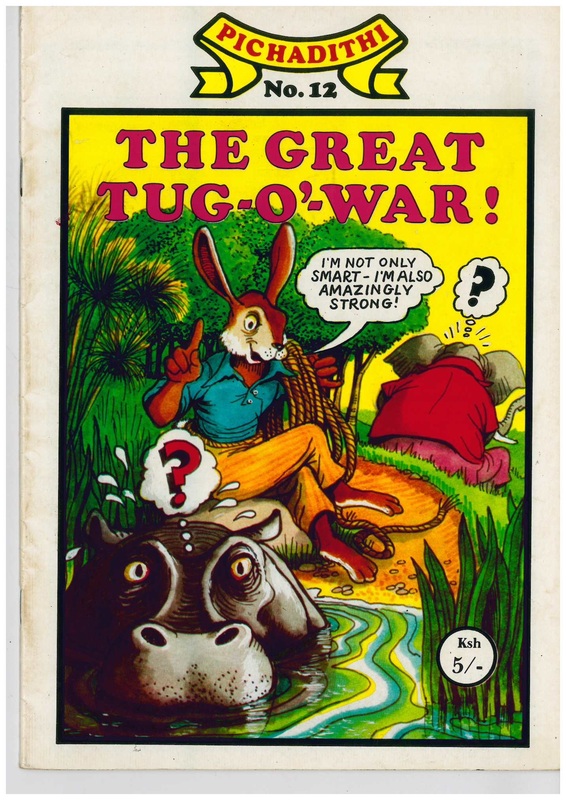 Later, with my third teaching contract ending, Ng’weno and I started one of the first satirical magazines in Africa, called ‘JOE’, after a character in the column. It was an immediate success, and quickly built circulation at home and abroad, but after a year or so, Ng’weno went on to start his prestigious ‘Weekly Review’. Nereas had joined us at ‘JOE’, after leaving Oxford University Press, and we ran the magazine together for the next ten years. I had also been invited to be the first editorial cartoonist in the ‘Daily Nation’, and these years, despite the increasing political repression, are among the happiest, creatively, of my life. At last, I had found ‘the freedoms that Europe had long forgotten’, without becoming a ‘commercial artist’, and doing what I wanted to do from inner necessity. I felt independent and free – I could draw and comment upon anything, and encourage others to do the same – but, of course, in the circumstances of the time it could not last. And it didn’t, as the ‘free press’ came under increasing pressure from political patronage and ‘correctness’, the space in the media environment for pluralist thinking of this sort shrank, and I fell into deep depression, and ‘JOE’ had to finally close its doors. Msanii Kimani: What a turn of events? Those were difficult times for all. Did other doors open when the “editorial cartoons-one” closed? Terry Hirst: But, of course, other doors open, as did “Pichadithi” for a while, and then a whole new market in the field of “development communications.” There were lots of opportunities, and I received commissions from ministries, institutes, NGOs and other donors, in soil conservation and tree planting, immunization and child health, sustainable development and zero-grazing, and information exchanges with children and so on – all of which proved to be very satisfying, and the fieldwork took me to every corner of Kenya, to listen and learn. Msanii Kimani: The silver lining to otherwise dark clouds. Terry Hirst: Indeed. Some substantial illustrated books came out of it, like the Kenya Pocket Directory of Trees and Shrubs, (a ‘bestseller’ for Kengo), Agroforestry for Dryland Africa that went all over the world for ICRAF, The Struggle for Nairobi, the story of the creation of an urban environment from scratch, for Mazingira Institute and Rooftops, Canada. There were many more pamphlets, posters and comic books on a wide range of subjects. But, inevitably, the field of development communications became infected with political correctness and inappropriate, if not truly illegal, procurement. Terry Hirst: I moved on to work more closely with Mazingira Institute and my friends— Davinder Lamba and Dianna Lee-Smith, in the growing market for what is called ‘programmed issuing’, as opposed to market publishing. This involved working directly with international foundations and ‘donors’, addressing development communication issues that we mutually agreed. We then found ourselves producing pamphlets, posters, comics, and documentary comic books, which we were then able to distribute free of charge to all primary and secondary schools, colleges and universities, mostly in Kenya, in very large editions of over 150,000 copies, but also often in East Africa and eventually in Africa at large. Msanii Kimani: What issues did these projects focus on? Terry Hirst: The issues to be addressed were largely about: shelter and housing; sustainable development; gender and democratic processes – as in the comic for girls called Where the Future Begins!, later published in eleven African countries, and The Seekers of the Secret of Success that was introduced into the Uganda Ministry of Education syllabus; Human Rights in a widely distributed documentary comic, Human and Peoples’ Rights, during the UN’s Decade for Human rights Education— 1995-2005; and on constitutionalism, in a long-running campaign called Designing Our Own Future that started with a documentary comic book, Introducing the Constitution of Kenya in 1998, and continued with posters, wall charts and pamphlets like ‘Civic Education’, 2001, up until, and including the Bomas Conference. This phase of work culminated with the publication of a 54-page documentary comic book on the ideas of Amartya Sen (and personally endorsed by him), targeted at university-level students in East Africa, and called There is a Better Way, adopted and launched at UNEP in 2003. Msanii Kimani: Which one was the most challenging and why? Which one do you think is the lousiest and why? Terry Hirst: Probably the Sen book was the most challenging. It is based entirely on his seminal work Development as Freedom, which is a daunting book in itself, despite its astonishing insights and clarity of logic. It took almost a year to finalize my script, working by e-mail with Anantha Duraiappah and the Institute of Sustainable Development, Canada, Flavio Comin and Sen’s office in Cambridge, England, and Davinder, of course, at Mazingira Institute. The actual finished artwork came off quite fluently, and was endorsed by Sen later ‘with warm regards and great appreciation’. The university-level target audience responded well, and they could not get enough copies in Cambridge or Harvard. Msanii Kimani: That is any artist’s dream. The lousiest? Terry Hirst: The lousiest? Well, the new art teacher training course that I had introduced at Kenyatta College was bitterly criticized by both the successful international artists, Sam Ntiro at Makerere and Gregory Maloba at Nairobi University, who thought it had departed too far from the British art school ‘model’ they had enjoyed and favoured – the ‘farce’ of training people to be artists, and then expecting them only to teach, whether they have a vocation or not – and it was quickly abandoned after I had left. The British art schools themselves (and the French,) had ‘exploded’ in 1968, and a great deal changed, but little changed in East Africa, where un-trained artists are still looked down upon, despite their frequent success in the market. Terry Hirst: There is no such thing as an ‘un-employed’ artist – you are either working at art, or you are not. The difficult bit is making a living: you either enter the market, and become successful – usually with an agent; or you work diligently with your day job, so that you can work on your art when you can; or you become a ‘commercial artist’, and work to order – trying to keep hold of your integrity. Terry Hirst: Teaching without a vocation is misery, and not very effective. Teaching art teachers to teach creative activity to children in a lively and stimulating manner – not just their own skills development – seemed to me the more positive way to go in our circumstances. Skills development for individuals with a gift, is another matter altogether. That can only happen with determination and dedication. Nobody can give it to you, you either have that inner necessity to express yourself – or you don’t. People will choose to live their lives as artists in the ‘gift’ economy whether anyone else intervenes or not. It will happen anyway; the things that have to be communicated cannot be prevented, as Rumi said, it is not that a means has to be found. Msanii Kimani: Where do you draw inspiration for your work? Who was your role model in the industry? Terry Hirst: As I said earlier, it mostly comes from an inner necessity to express oneself. In the community and media environment you live in. Creative people – in fact most people – go through three phases to gain this understanding, or ‘tasks to fulfill in our lives’, as Franz Schumacher put it. The first is to learn from society and its traditions, and to find temporary happiness in receiving direction from outside; the second is to interiorize the knowledge gained in the first task – to sift it out, and in the process to come to realize who you are – and in the process to become inner directed; and the third task is to avoid all ego-centric pre-occupations, and cease to be either other directed or inner directed, and achieve creative freedom, or what other cultures call ‘Azad’. Msanii Kimani: I like that. Important and definitely insightful observations. Terry Hirst: At this point is where social commissioning really starts to operate, and the work you do is inspired by, not by outside ‘commercial’ vested interests or by personal internal opportunism, but by a genuine desire to offer work for the common good, or what used to be called the commonwealth. It may sound idealistic, but the role models for it exist throughout the history of the graphic arts. I came to realize very early in England that I was part of a very vibrant tradition, in which hundreds of outstanding artists had taken part since the time of Hogarth, but soon came to learn that it existed – quite indigenously – all over the world, so that it is now and integrated cultural global inheritance of human experience in times of continual change. Young artists need to work at their first ‘task’ much harder, and understand where they are coming from. Msanii Kimani: What is your opinion of the comic industry in the Kenyan and African literary scene? Terry Hirst: The comic book industry in Kenya has yet to realize anything like it’s full potential, and there are markets in East Africa that are yet to be explored and established, (let alone the export potential) by venture capital and creative investors. Understanding what has been achieved elsewhere remains the key to it for creative spirits in our emerging market economy. Msanii Kimani: What needs to be done to increase its vibrancy? Terry Hirst: The publishing industry is still clinging so tight to its founding British colonial ‘model’, and relying too much on printing school textbooks – so you can’t blame the writers in the literary scene. People are persuaded about new ideas when they are moved emotionally in a relaxed manner and agree intellectually, and this opens the door for the graphic artists. 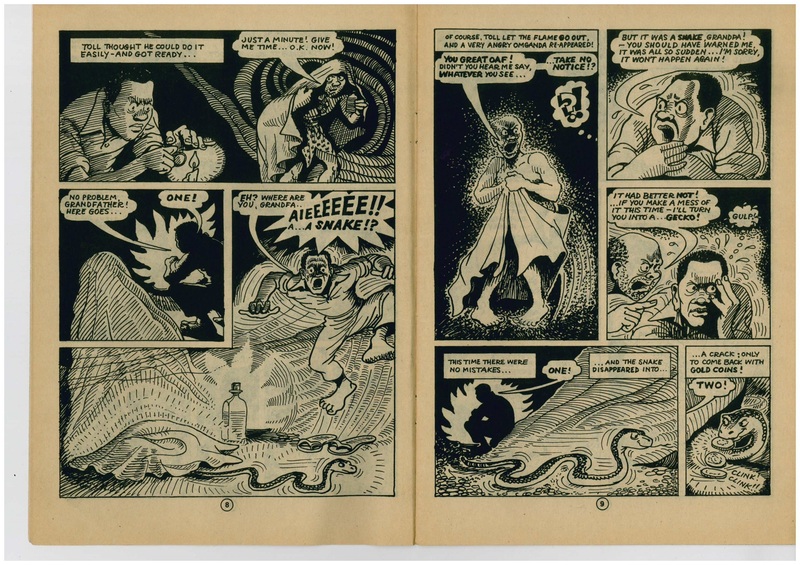 “Comics emotional powers remain under lock and key in all but the most subtle and dedicated hands, and the potential of comics to communicate ideas – maybe their greatest promise – is to date their best kept secret.” Scott McCloud, Reinventing Comics, 2000. Msanii Kimani: Wise words that are informed by many years of research and practice. What do the young creative venturing into market need to do? Terry Hirst: Young creative people must ‘learn their songs well before they start singing’, and then do so with focus and dedication. You must have something to show – something that a prospective publisher can see that they can make a profit out of – where you have invested your mind and skills. Don’t wait for people to ask you – do it! Msanii Kimani: Do you think the industry is able to support an artist to live off it? Terry Hirst: Put it this way, the field is there waiting to be used and exploited for everyone’s benefit, although, as yet there is no comic book industry in terms of training, publishing and distribution. But it can be fairly quickly established, once the concept is recognized, and artists and venture capital organized. The large media groups and their distribution systems – and preconceived ideas about development – present major obstacles, but even these can be fairly easily overcome with district-based electronic systems, and small local production units, today. Perhaps nobody will make a fortune – but a lot of artists would make a decent living for their families. Msanii Kimani: Is there hope for it beyond the occasional illustrations in the newspaper? Msanii Kimani: What is your opinion of the cartoonists in the newsroom? Terry Hirst: The marketing department of the Nation group invited me to be the first editorial cartoonist on the Daily Nation and Hirst on Friday become beneficial to the paper, as subsequent surveys showed. But in those days, the newspapers were still working out their relationships with politicians and commerce and it was difficult to always be sure of ‘the party line’ from editorial. At first they even tried to change my captions, without reference to me, until I protested vehemently about independence. In the end we compromised, with me leaving mild ‘joke’ drawings in advance, in case they felt unable, or unwilling, to use the current drawing. Msanii Kimani: An astute walk down memory lane………..
Terry Hirst: But nowadays, few editors are willing to let the artist have such complete freedom, although by the looks of it Gado, Maddo, and Kham hold up pretty well, and there is a tradition in journalism that allows left-wing artists to work on right-wing newspapers – if they sell the paper, which they often do. But there is a rethinking going on about the traditional organization of the editorial department that has created ‘a new breed in the menagerie of talent’, as Harold Evans called it as long ago as 1976, and scooped by the marketers under the rubric of ‘convergence’. The new systems of the media cross-fertilize ideas between the verbally gifted and the visually gifted. There are now designer-journalists and journalist-designers, who care about vivid communication, but so far we only usually see such products used in our press from the international agencies, despite all the ‘convergence’ that is supposed to be going on. Msanii Kimani: Would you say there is a favourable market for comics in the Kenya and Africa in general? Msanii Kimani: What are the other things that you like doing when you are not working? What are your hobbies etc.? Terry Hirst: When is an artist not working? I am a voracious reader, and people send me books from all over the world. I enjoy social company, but increasingly I am happily a bit of a ‘loner’, being content to listen and watch – and, of course, think and write. I am writing for my grandchildren in 2020, when they will be able to understand that ‘guka’ would not lie to them about the state we were in, and how it came about. Msanii Kimani: What are some of the other extraordinary things that have happened to you and also added invaluable experience to your life as an African cartoonist? Terry Hirst: In a way, everything was extraordinary to me, and always added valuable experience to what I wanted to do. In many parts of Kenya, when I met people who were familiar with my work and enjoyed it, I was always a little amused that they were surprised (and perhaps a little disappointed) that I was a ‘mzungu’ – but we all soon got over it. Excellent! Pichadithi books were our favourites growing up in the 80’s. I was very sad at the passing of Terry Hirst, and this interview is a great tribute to him and a celebration of his life and work. Mr. Kimani, could you check again and inform us of where we can get the Pichadithi books? Fare thee well Terry, we all shall miss your chuckles and humor in our lives. Your humor gave life to “things environment”. Really enjoyed this walk down memory lane. Thank you Terry for sharing your memories and Kimani for taking the time. Invaluable! Reblogged this on msingi sasis. Great interview and this took me down memory lane. I think I must have read all the initial series I could lay my hand on back then, these are the stuff our kids are missing. Is there a way one can even access these now? Charles– let me find out form the publisher and will revert. Muzuriest! We owe Terry a lot. Thanks Maddo. A few more interviews coming to this blog. Great interview. I really enjoyed this as I grew up reading those comics which cultivated my love for reading. I wonder where I can get them today. We always ask why Kenyans have a poor reading culture. I believe if we want that to change exposing our children to comic books can go a long way in getting them to love reading like in my case. More so culturally relevant African stories like pichadithi . I remember how during story time in high school I would draw from the books and have an interesting one to tell. This was an awesome series and yes, I think we need more comics to inculcate the reading culture.